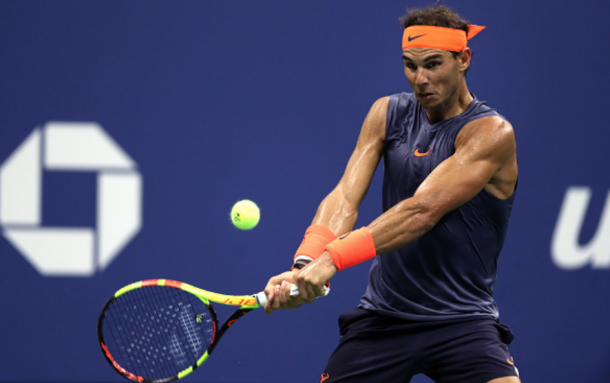 The Spaniard and Austrian fought long into the night in New York as Nadal edged out Thiem in 4 hours and 49 minutes. It was their 11th meeting but the first time they saw the courts against each other outside of clay. 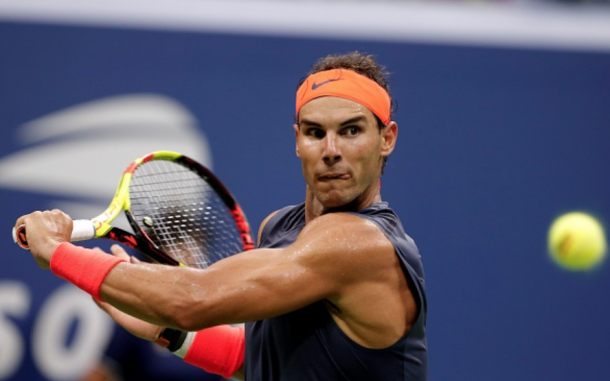 A rematch of the French Open final took place in the US Open quarterfinals as Rafael Nadal met Dominic Thiem for a spot against Juan Martin del Potro in the semifinals. Despite a first set which saw a bagel, these two put on a show past two in the morning in a match that went nearly five hours long. Nadal came out the victor in what goes down as the best match of the tournament so far winning 0-6, 6-4, 7-5, 6-7(4), 7-6(5). The Nadal strategy is to attack the one-handed backhand, but the Austrian just seemed to be able to take it early rip it. The top seed found some footing getting it to 30-30 though Thiem once again broke again to get up 5-0. A strong service game marked the first time since 2006 that Nadal failed to win a game in the opening set in a major with the ninth seed's 6-0. The top seed kicked off the second set with a hold of serve trying to get the crowd back in it yet could not get a look on the return of serve with two shanked returns in Thiem's service games. The two held comfortably, but the top seed began to find himself in the Austrian's service games. A trademark down the line winner set up break point for the Spaniard, his first true looks on his service game and converted it at the first time of asking. Nadal was coming into the net more this set and really dealt with team's blows pretty well. Despite that, an excellent return on break point put the Austrian back on serve at 4-5. Thiem began to play a little more sloppy, and that played a major factor serving to stay in the set with a few unforced errors as Nadal broke to take the set 6-4. Thiem direly needed a comfortable service hold to start after being broken twice to end the set. He all of a sudden found himself down 0-30 after missing a swinging forehand volley into the net. It was a gutsy effort as he kept it on serve. From 40-0 up, Thiem dug himself out of that hole to get a break point. Both players traded powerful strikes, and it was capped off with Nadal finishing it off with a backhand winner which caught the line. Another service game where it looked easy for Nadal was made difficult as he missed a volley to set up break point. Thiem was not fooled at all, guessing on the Spaniard's down the tee serve and hitting a clean forehand return winner for a 4-3 lead in the third. Those monstrous groundstrokes from the nine seed began to appear again after that break of serve. Nadal held at 30, applying the pressure to Thiem as he looked to go up two sets to one. The defending champ immediately asked Thiem if he could close out the set, and the Austrian was down 15-40 after a backhand pass and a double-fault. Thiem's powerful backhand was so important tonight but chose a horrendous time to bring it out on a short ball at the net as he smacked it long. Against Nadal, there are no easy points and that was made evident as the Spaniard battled back to hold set point with a couple of backhand winners. The Austrian pulled out a couple of timely serves to save two break points, however, a massive missed volley wide when he had an open court proved to be vital as third time was the charm for Nadal to take the set 7-5 on a forehand winner. A bridge over troubled water began to collapse with Thiem on it as his overhead at 15-30 was smashed right to Nadal only for the top seed to hit into a wide-open court. That bridge stayed afloat as he held for one-all. It went from trouble time for Thiem to trouble time for Nadal as the top seed was now down double break point. First blood went to Thiem in the fourth, but could he hold onto that lead? The defending champion saved two break points and had a chance at a third after Nadal missed a simple volley wide. The Spaniard held for 2-3 and for the fourth time in six games, a returner held a 15-40 lead. Thiem dug himself out of the hole for a 4-2 lead while Nadal had the first comfortable hold in quite some time. Servers didn't have it easy as a missed forehand at deuce gave Nadal a fifth break chance. Thiem went for it all with that backhand down the line that was doing damage all night, but it missed long. The spectacularly solid Nadal at net oddly missed a routine volley that gave the ninth seed a break point. Hit with the time violation, Nadal calmly responded by saving it and holding for 5-4. The 25-year-old Austrian did what he needed desperately, a hold at love. The three-time champion eeked out another hold, saving another break point. Another unexpected volley miss from Nadal gave Thiem game point rather than facing match point. A tiebreak is the only thing this match was missing, and we got it in this fourth set. That volley miss seemed to bother Nadal as he quickly found himself down 0-3. The server held firm until the Spaniard's slice floated, allowing Thiem's backhand winner to set up triple set point. Despite losing one point to send it to 6-4, Nadal missed a forehand to send what began as a blowout into an epic which was worthy of a decider. 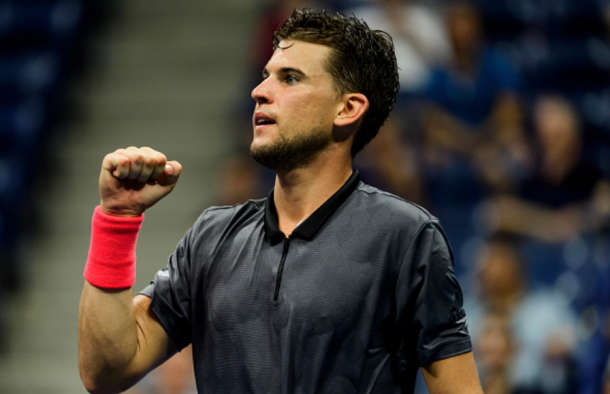 Thiem's hustle was rewarded as his lob forced Nadal to knock a backhand volley long for 30-all in the fourth game, despite that, it remained on serve in the early stages of the final set. The nine seed outwitted the Spaniard on a key point which made the point 15-all after Nadal hit his forehand right at Thiem who put a volley away. The 25-year-old began to press though, hitting a forehand wide to set up double break point for Nadal. Similarly to the fourth set, the French Open finalist continued to find answers when he was down break points, holding for 3-2. 30-all in the fifth game proved to be another massive point where Thiem hammered a backhand right at Nadal as he missed another volley. The Austrian held at 30 for 5-4 to see if Nadal can hold to stay in the match. Thiem captured the opening point on the Nadal serve, but that's the only dent Thiem would make as it went to five-all. The top seed took the opening two points after a volley winner and a backhand error from Thiem. 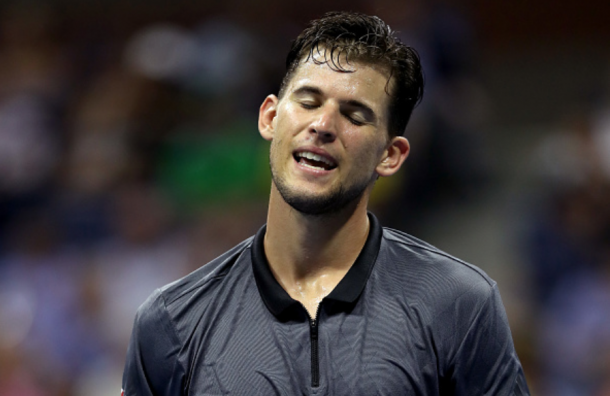 A double-fault for 0-40 confirmed those nerves from Thiem. Two unreturnable serves brought it to 30-40, but Nadal shockingly dumped a second serve return into the middle of the net. The deuce point was out of this world with Thiem taking control, and Nadal sending back lob after lob before the Austrian capped it off with a drop volley winner as he held for 6-5. This match would see itself in a final set tiebreak. Nadal was the first to hold serve for 2-1 with a volley winner as he improved on his finishing in the forecourt after so many missed chances. Thiem gave the mini-break back after overcooking a forehand as Nadal led 3-2. The Austrian leveled it after a phenomenal slice winner which saw him slide up to get a Nadal drop shot as both men had plenty to think about on the change of ends. Nadal missed a backhand long, putting him under pressure serving down 4-5 to win both points. The top seed pulled out the body serve once again for five-all as the tension hit its peak here on a point that would set up match point for one of these warriors. The Spaniard would be the one to hold match point after another strong point which saw him return Thiem's overhead back to the Austrian, and a forehand winner closed it out. Thiem's wide serve put him on the attack, but the trademark Nadal defense was there when it was needed, sending a backhand slice lob to Thiem who bricked it long. Nadal, aware of his opponent's efforts, didn't even wait for Thiem to come up, walking over the net to extend his arms to his good friend.